The Chocolate Baroque Zentangle Group Challenge for September (Number 18) is based upon the theme of "Wings." 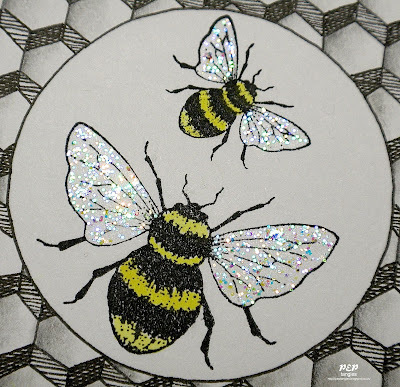 Since I have a particular delight in bees I wanted to use the bee images from Chocolate Baroque's Honey Bee stamp sheet as the basis for my Zentangle Inspired Artwork (ZIA) interpretation of the challenge. 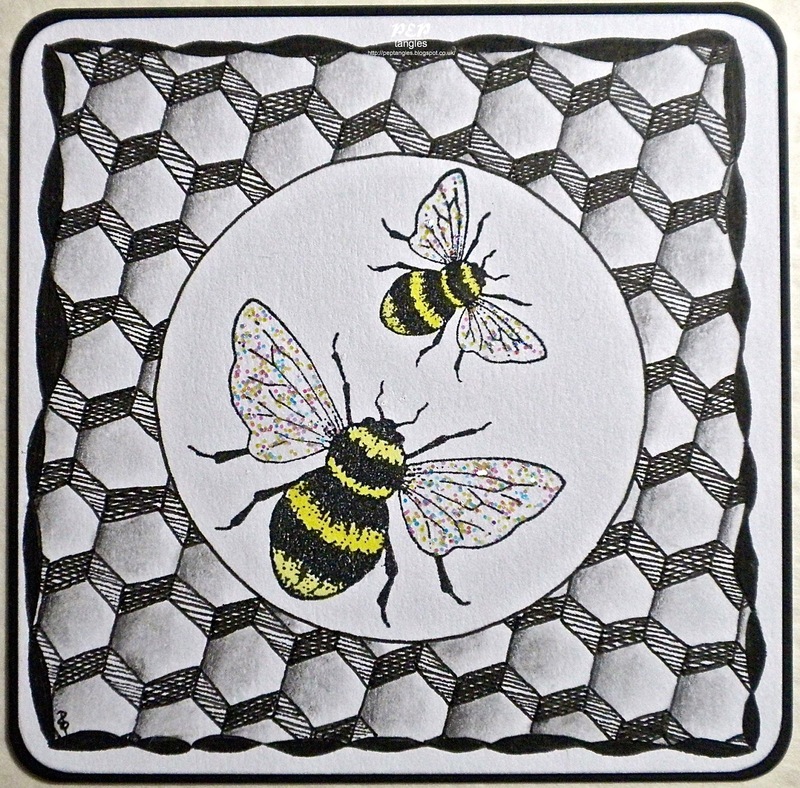 I know that Zentangle is intended as art of an abstract nature but I couldn't resist creating a little habitat for my bees from Kass Hall's Honeycomb tangle (also demonstrated by Ellen Wolters in video format). My edging is simply two wavy lines crossing one another with the segments filled in & the whole 3½ inch square tile is mounted onto a slightly larger piece of black cardstock. Stamps Chocolate Baroque UA5SP0375 Honey Bee. Inks VersaFine Onyx Black (bees). Pencils/Markers O1 Uni Pin Drawing Pen, 2B Lakeland Graphite Pencil. Colouring Nicholson's Peerless Transparent Water Colors (bees' bodies), Crystal Ice Stickles Glitter Glue (bees' wings). Cardstock W H Smith 220gsm White; Black from stash. Goodness, where did August go?? This is a great tangle to surround your lovely bees, they would be at home in this honeycomb. How very ingenious to tangle the honeycomb effect Paula, it really draws the whole piece together and the hints of yellow on the beets and touch of glitter really lift them. Very clever Paula, those two definitely look as if they are involved in a 'dance'. Pollen is this way!! 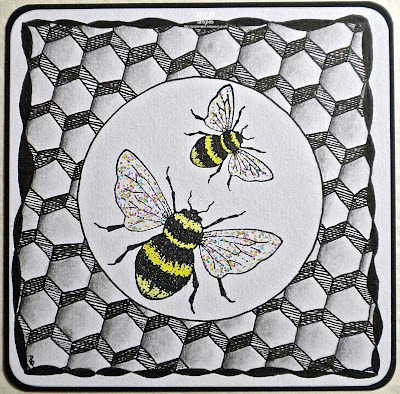 Your bees are stunning Paula, (I love the sparkly wings)and they look perfectly at home in the tangled honeycomb. AWESOME! Those bumble bees were the perfect compliment to your beautiful tangled work. Blessings, my friend!